James Bond movies have been around for 53 years, so it only makes sense that audiences have come to expect certain things from the films in the series. In that, there have various incarnations of the character, from various companies, resulting in 26 movies. Given that legacy, when someone pictures a "James Bond movie", a particular set of ideas come to mind and the viewer is justified in anticipating those things to be in the film. Ah, but here's the flipside of that argument -- at a certain point, don't these expected elements turn into cliches? Shouldn't the audience ask for something new and different? When Daniel Crais was cast as the new Bond in 2006's Casino Royale, we get a 007 for a new era -- one who was very tough and preferred brute force to being suave. 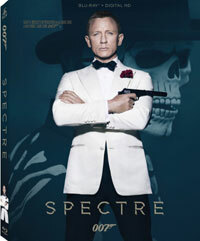 This seemed new and fresh at the time, but Spectre proves that it may be time shake (not stir) things up again. As Spectre opens, we find James Bond (Daniel Craig) in Mexico chasing a lead. Despite causing quite a bit of property damage and killing the suspect, he thwarts a terrorist attack and gets a lead, "The White King". Back in London, once M (Ralph Fiennes) finish chewing out Bond for the Mexico incident, he informs the agent that their section is merging with another and C (Andrew Scott), who wants to dismantle the 00-program and move to computer surveillance, will be taking over. Bond ignores all of the new rules and heads to Rome to follow his lead. There, he learns that a man that he thought long-since dead is not only alive, but heading an evil organization called Spectre. Bond then seeks out another old nemesis, which leads him to the man's daughter, Madeleine (Lea Seydoux). Together, the two will explore their respective pasts and Bond will learn deadly secrets about his childhood. OK, let's do the James Bond checklist. Action-packed opening sequence? Check. Exotic sports car? Check. Trips to various international locales? Check. Romantic encounters? Check. Bond trapped while villain talks? Check. Martini? Check. Yes, everything that one would expect from a James Bond movie is present. We get M, Q (Ben Whishaw), Moneypenny (Naomie Harris), and some gadgets. (Although, the gadgets are a big letdown.) Some of these elements may be updated and streamlined, but they are there. Familiarity is a good thing, but, again, haven't these things become cliches? Eighteen years ago, the first Austin Powers movie took these ideas to task, so even in these "new look" Bond movies, the plot points have become overly familiar. You know what they forgot to put in Spectre? Anything remotely interesting or exciting. I was apparently in the minority with my dislike of Skyfall, and my review for that film stated a desire for more action in the next Bond movie. And, on the surface, Spectre doesn’t disappoint in that respect, as we get the opening scene, a car chase with cars, a car chase with a plane, a fight on a train (I hadn’t planned on that rhyming) and a race against time in a building which is set to explode. And yet, it all comes across as pointless. As one would expect from a Bond film, the set-pieces are well-staged, but there’s no real sense of danger or suspense from them. The non-action scenes are even worse. If it’s not Craig mumbling his way through expository dialogue, then it’s a shockingly dull moment in which M talks about politics. There is a semblance of a plot here, and a twist in the final act, but none of it is the least bit complex or intriguing. And then we have the question of when all of this is taking place. When Bond was re-booted with Casino Royale, I don’t think that I caught on that we had entered a new universe where events from previous James Bond movies hadn’t happened yet...although there are moments which contradict that idea. While Spectre is clearing taking place in our present, the ending implies that it is occurring long before 1967. Am I nitpicking here? Yes, but this only goes to prove that today’s James Bond movies are trying some odd gimmicks to keep the long-time fans involved. This goes beyond fanboy stuff into a truly odd realm. And what will this mean to casual fans like me? Not much. Boring, humorless, and predictable, Spectre is not the kind of glamorous Bond film we are used to. Am I the only one that misses Roger Moore? Spectre should inspire Mike Myers to make a new Austin Powers movie on Blu-ray Disc courtesy of 20th Century Fox Home Entertainment. The film has been letterboxed at 2.35:1 and the Disc contains an AVC 1080p HD transfer which runs at an average of 25 Mbps. The image is very sharp and clear, showing no distracting grain and no defects from the source materials. The colors look very good, and the film does a nice job of contrasting earth and silver tones with richer colors. The image is never overly dark or bright. The depth is impressive, as the actors are clearly separate from the backgrounds, and the level of detail is very good. The Disc carries a DTS-HD Master Audio 7.1 track which runs at 48 kHz and an average of 6.2 Mbps. From the epic opening scene, it is clear that this is a muscular track, as we get highly detailed stereo and surround effects, accompanied by wall-rumbling subwoofer action. The surround sound offers nicely detailed effects where we can pick out individual sounds and the Bond theme sounds great. The Spectre is surprisingly lacking in extra features: "Spectre: Bond's Biggest Opening Sequence" (20 minutes) takes us on-location to Mexico City to see how the beginning of the film was shot. We start with the planning stages and move through the costumes and makeup for thousands of extras, the choreography the huge props, and finally the challenge of actually shooting the complicated scene. "Video Blogs" (9 minutes) is a selection of six brief vignettes which look at the actors, the cars, and the music. The extras are rounded out by three TRAILERS and a STILL GALLERY.